Antlers - Antlers are bony protrusions found on the skulls of animals in the family Cervidae. Commonly called the "deer family," Cervidae include animals such as deer, elk, moose, and reindeer. With one exception antlers are grown only by the males of the species. In reindeer both males and females grow antlers. 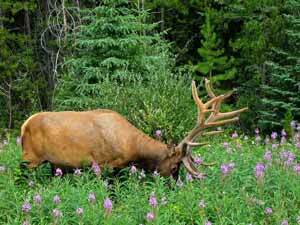 Antlers are not a permanent part of the animals' skull but instead are grown, shed, and re-grown annually. A bull elk with antlers. You can shop for antler chandeliers here. You can shop for moose antler chandeliers here. Around The Horns - In team roping and some other competitive roping events, around the horns is one of three legal head catches. Around the horns is sometimes called a "horn catch" or "a clean horn catch." An around the horns catch is pictured below. The loop goes underneath both horns. For more information about the three legal head catches, you can see this page: What Are The Three Legal Head Catches? 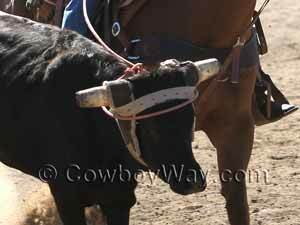 Below: An around the horns catch, one of three legal head catches in team roping and some other competitive roping events. The steer in the above photo is wearing a protective horn wrap. You can shop for horn wraps here. The other two legal head catches are a half head, and a whole head (sometimes called "around the neck").